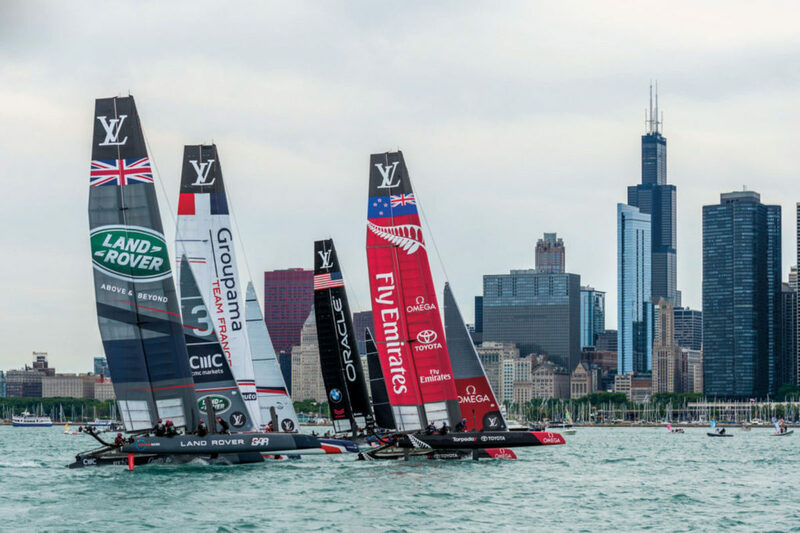 Despite the late arrival of a decent sailing breeze on the first official day of racing, organizers, fans and the sailors themselves had nothing but good things to say about the Louis Vuitton America’s Cup World Series Chicago regatta, which took place this past June. Indeed, the first-ever America’s Cup event on the Great Lakes had a little bit of everything, including plenty of thrills and spills (read: dramatic capsizes!) on a boisterous pre-regatta practice day; more of the same close-quarters racing that has come to characterize the 35th America’s Cup thus far; and a strong showing by two of the supposedly “weaker” teams, highlighting the fact that the 35th Cup remains as wide-open as ever. Better still, there was a surfeit of fans—good news for an event looking to broaden its appeal among the general publich—with sold-out paid seating, thousands of walk-in spectators lining up along Chicago’s historic Navy Pier, and thousands more fans watching from a substantial spectator fleet. Winning the regatta was Sweden’s Artemis Racing, a squad that has had trouble getting into the groove, but which closed out the regatta with an impressive first-place win and two second-place finishes. Also coming into its own was Softbank Team Japan, with former Emirates Team New Zealand skipper Dean Barker at the helm, scoring two race wins on its way to third place overall. Taking second overall in the event was British-flagged Land Rover BAR, with Sir Ben Ainslie at the helm. As for those capsizes, the first to go over was Emirates toward the end of a practice match race with Oracle Team USA. The team, however, quickly recovered and was back up and running in time for a subsequent fleet race. Less fortunate was Oracle Team USA, which flipped during that same fleet race when it was forced to take evasive maneuvers after failing to see Artemis Racing coming in its direction with right-of-way until it was almost too late. Not only did it knock Oracle out of the running for that particular practice race, but because the race committee couldn’t get in the requisite number of races the following day, that last-place finish ending up factoring into the overall standings as well. 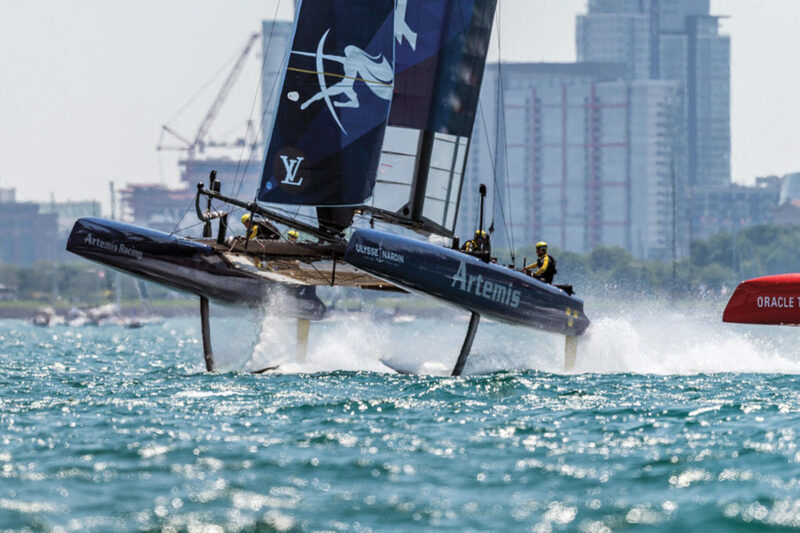 For more on the event and the upcoming Louis Vuitton World Series regatta in November, visit americascup.com.